Radiant ceiling panel systems can be used during a building retrofit process while earning points toward LEED certification. Radiant ceiling panels offer temperature gradients so low between ceiling and floor that there is less than one degree of difference. The heated ceiling panels are heated in one of three ways: water pipes, electric or air flows embedded in the panel. Of these three, electric circuits and water pipes are the most used solution. Your selection will be based on the actual energy costs and the size of your project. Using hydronic radiant ceiling panels in commercial buildings typically consist of aluminum panels painted white with non-visible copper pipes on the back which handle the water flow. The panels incorporate acoustic material to address the building's need for NRC (noise reduction coefficient). The ceilings typically save 25% of a building's energy costs. The initial cost will range in price from $200 to $500. However, each zone requires its own thermostat, which is approximately $40. Radiant panels are maintenance free and will provide savings on utility bills by maintaining temperatures at a pre-determined level. Surface-mounted electric radiant ceiling panels spread the heat, using heat transfer principles. It is also the same principle as an outdoor environment with sunny skies; the sun (in this case, our radiant panel) will emit heat and the rays will get down to the room or people to warm them. Electric panels have electricity as their sole utility, are quite simple in construction, and ​have a lower 'up-front' cost. Water, on the other hand, can be heated by almost any utility, be it natural gas, propane, oil, wood, solar, or electricity, and is quite versatile. Radiant ceiling panels typically consist of a high-density fiberglass insulation board, a heating element, and a textured surface coating mounted in a frame. The thickness of these panels is usually a one-inch panel, ranging in size between 1 x 2 and 4 x 8, powered by 120 or 240-volt current. 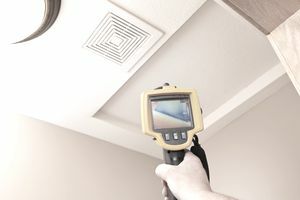 Radiant ceiling panels can offer you a range of temperature of operation between 150 to 170 F and can achieve that temperature within 4 minutes or so of being activated. Some underfloor systems simply rely on air currents within the joist space and the mass of the wood subfloor to spread the heat. Underwriter's Laboratory has approved most radiant ceiling panels. INDEECO: Radiant panels maintain an even temperature from floor to ceiling. Features include power range from 250 watts to 715 watts, voltage rating up to 277 V, 0.9 amps to 5.2 amps, 610 mm width & up to 1219 mm height. Ceiling mounted panels allow full use of floor & wall space. AERO Tech Manufacturing: Types of panels include lay-in formed metal panels, snap-in formed metal panels, linear panels & linear extruded panels. Features include sound control and color retention.